There’s a film quote that has stuck with me; “You Catholics don’t celebrate your faith, you mourn it”. In my own experience, this is the sad truth. I attended a convent school as a child, where I learned that I was born a bad person. Attending mass and praying were ways of apologising for this, and hopefully making me just about good enough to get into heaven. So every week we would begrudgingly trudge to mass, out of a sense of obligation, rather than any sense of wanting to. For most people I know, mass is not something to be enjoyed, but endured. 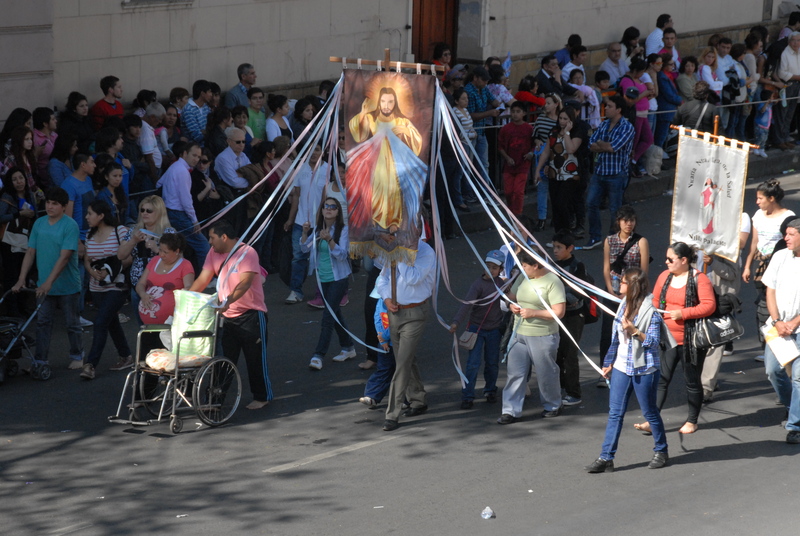 Which is why the procession in Salta struck me as so unusual. Here I was in a Catholic country watching people make their pilgrimage to church, but everyone was smiling and celebrating. 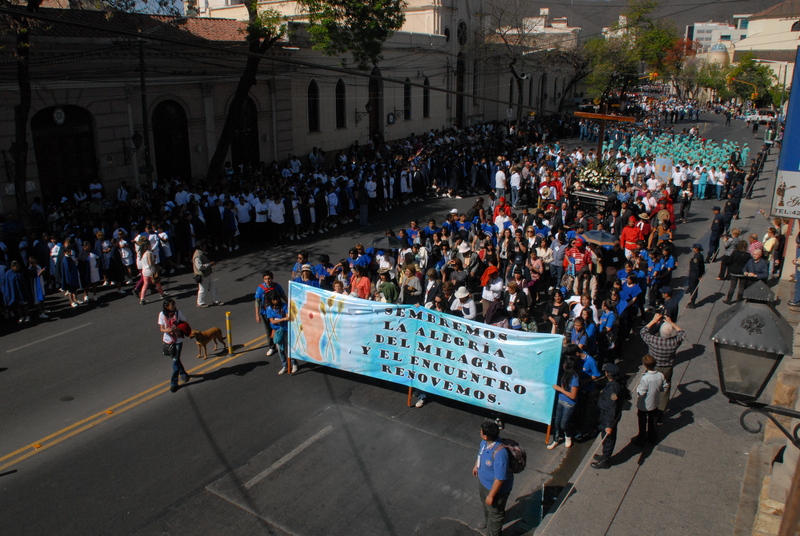 It was a joyous occasion; the crowds made their way through the streets towards the pink church in the main square, while others watched and waved Argentine flags. 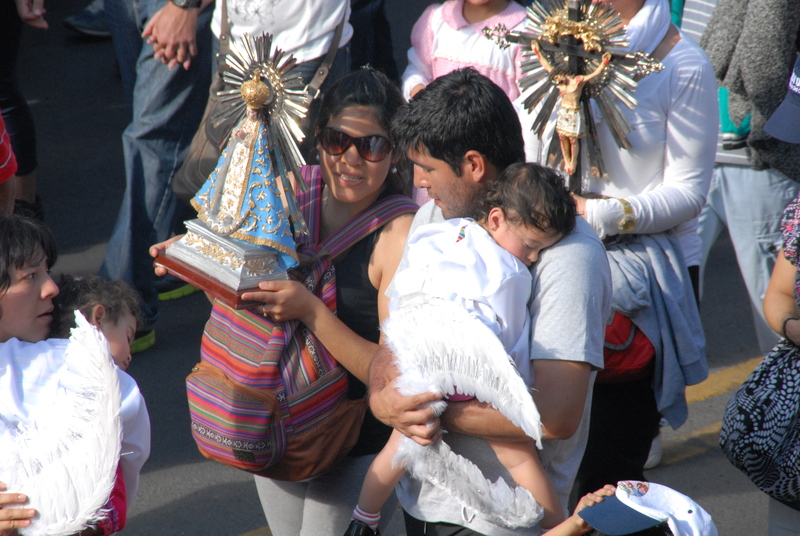 Some carried statues and pictures of the Virgin Mary and Jesus,some carried decorated crosses, and some carried adorable infants dressed as winged angels. 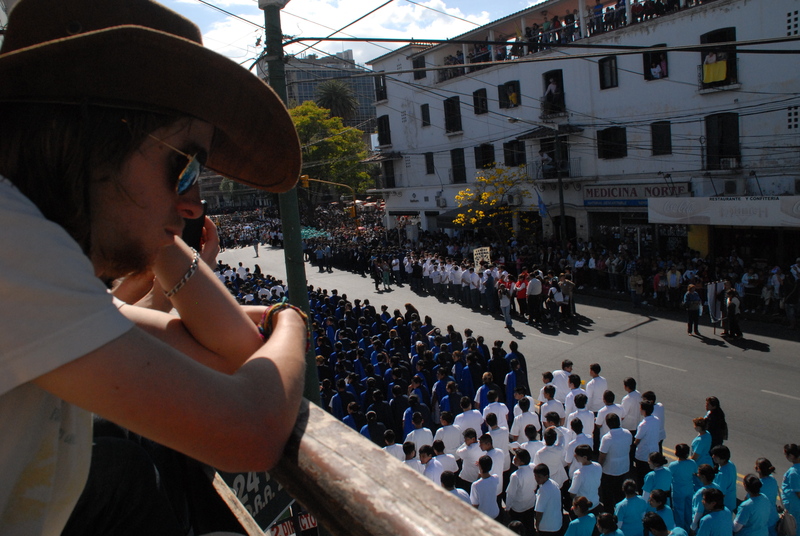 Myself and others watched the procession from the balcony of our hostel. Blocks of colour passed below us, a green square of doctors in scrubs, hundreds of navy-clad police officers, and beige-cloaked monks. There were people in the traditional dress of khaki clothes covered by a red cape, soldiers in army fatigues, and nuns in clean white habits. Thousands of people made their way up the street in a seemingly never-ending stream, while we took pictures and tried to shade ourselves from the sun. 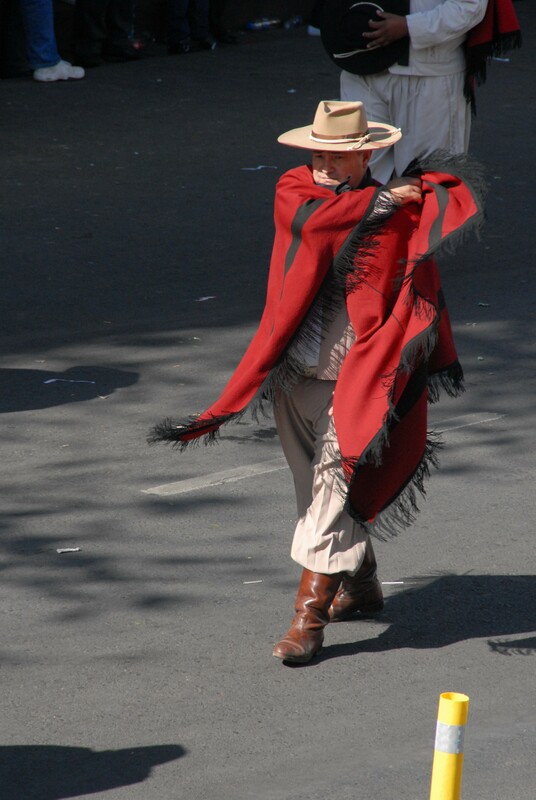 Rosa, a girl in our hostel, explained the history of the procession to us. 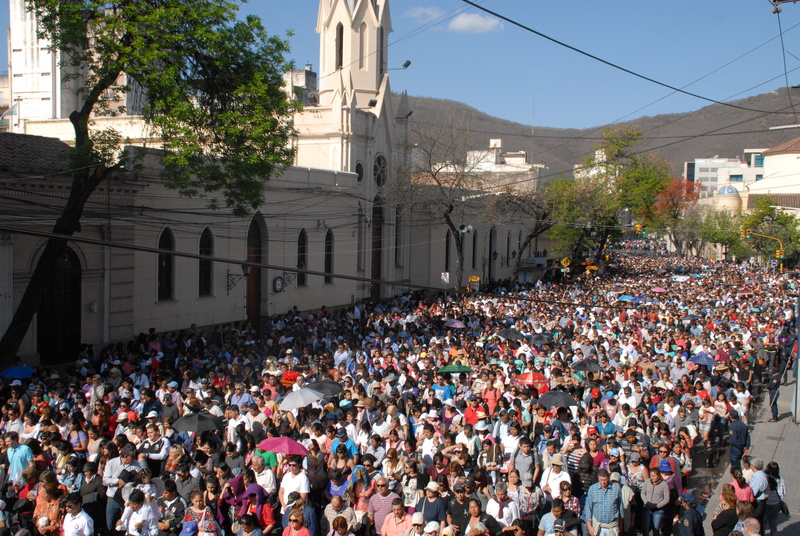 It’s called the Proseción del Milagro (Miracle Procession), and is an annual commemoration of an earthquake in the region, which the people believe stopped when they prayed to Mary and Jesus. The crowds of people finally reached the main square, and the street outside our hostel emptied. We sat drinking beers as the sun went down, and I thought about how different the procession had been to my own experience with Catholicism. The day had been about joy and gratitude, and had united thousands of people in celebration. The crowds returned along the street long after it had gotten dark, after spending hours in prayer at the church, and they were still singing and smiling as they walked. For me, it was a welcome change to be among people who see their faith as something to be celebrated, not mourned.